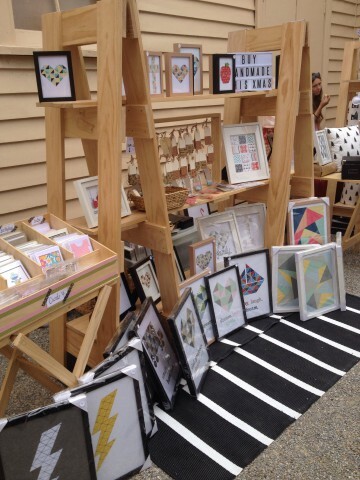 I dont like saying one market is better than all others, but I definitely have to say that Maribyrnong Makers Market (MMM) is my favourite. It is a week since the November market and I think it nearly takes me a week to get over it! It is such a big build up getting ready for it. Building up the stock, keeping up with social media (I manage the MMM facebook page too), helping setup all the market. By the time the market starts I am exhausted. We are always challenged by the weather at MMM November markets. This year was no exception. The heat, the wind and then a light drizzle. I was pulling out the sunscreen, then the drop cloths were coming on and off my display. The one thing that makes this market good are the people. It has such a great community feel. The market is run by volunteers so they are always walking around with a smile. 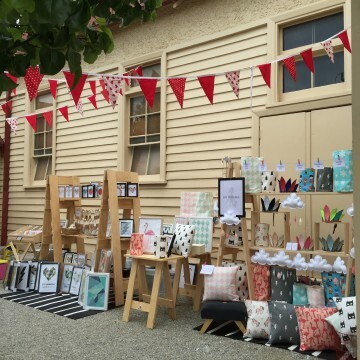 The other stallholders are not just stallholders, they are friends. We all get along so well and can leave our stall for periods of time and know that someone will be watching it and will make the sale if needed. The photo above was taken by the beautiful Bree from Sir Trouble. We were next to each other at MMM and had matching displays. We have teamed up and made some matching products and it was great to be able to display them together. I have learnt not to always measure markets on the sales of the day. When I didnt reach the amount I was hoping for on the day, I knew not to be dissapointed. In the days following I received several more orders via emails. I have learnt that some of the best buyers are ones that grab a business card on the day and have a look online in their own time and contact me when they are ready. This weekend I am happy to have the weekend off markets. But then I will have six in the next three weeks. No time to rest for me!